For reading my blog for 31 days, you have earned a free, extra-special blog post at no extra charge. Please take a moment to pat yourself on the back. Come on. Do it. We are all waiting. OK. This isn't an April Fool's prank. There's is only going to be one day of April Antics as I will return to updating my blog weekly next week, but I just had some more cool stuff to share that I couldn't wait until next week. First, I didn't have a chance to include this look of excitement on Kyle's face when he beat the game he has been trying to beat at Red Robin since they put those personal little kiosks at the table. Second, I went to work today and was escorted by two wild turkeys. It's not unusual to see wild turkeys in Idaho, but not something you would expect to see in downtown Boise. I don't know if someone dropped them off as an April Fool's prank, but I think it's a sign from the universe that I'm awesome and I will have a wonderful rest of my life. I mean being escorted by wild turkeys has to be good, right? And I apologize for some of the photos as the sun was in the way - damn you star that provides light and hear for the Earth - but I felt like TMZ stalking a celebrity as I was just snapping photos all the way to work. Hopefully those turkeys ended up where they wanted to be. Finally, a picture that is not animated. 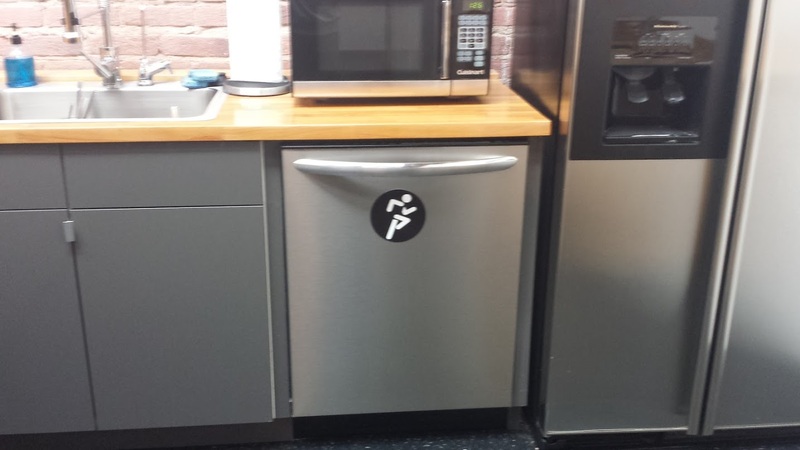 It's just a picture of the dishwasher at work with a running magnet on it. Do you get it yet? 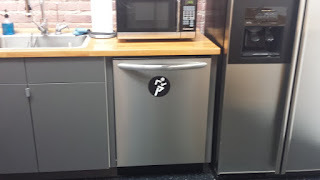 Our office manager is an amazing guy, and he used to put a paper towel over the handle that had the word "Running" written on it to help people understand that the dishwasher was in use. Well I thought it would be pretty funny if I could find a magnet of a person running for our office manager because he's amazing remember and he could just throw that on the dishwasher when it was in use. I found one, and everyone did think it was pretty funny. Thanks for stopping by. Happy April and have a lovely weekend. Wild turkeys, that always makes me smile. I used to wonder who or what upset them! Nice last post, fortunately today is the 2nd April so you didn't make me an April fool. Games at Red Robin! When our kids were little they used to play Mad Scientist. Drink a glass of water half way down and then add in all the little packets they have on the table - trying for the old baking soda and vinegar trick. Wild turkeys. You had a great opportunity to make turkey roast. You missed it. Very hilarious post. I enjoyed reading it. I hope you and Kyle are watching the cards and pirates right now. i'm looking at the beautiful green grass and spotless white uniforms, the world can be a wonderful place when things are done right. We have a lot of turkeys around here too. I was driving to my Mom's once and in the distance saw what I thought was a kid walking in the street. As I got closer it was a darn turkey with his neck all stretched out. I stopped my car and he walked right beside me, glad I was inside.